There's something about the Coca-Cola commercials of the past that makes us non-polar humans more okay with the bitter cold and winds of winter weather. The caffeine loving polar bears in the dark Arctic landscape really knew how to embrace the cold season. For instance, they got together to drink bottles of Coke while watching the Northern Lights. How great is that? We don't even get together to drink soda with our neighbors when the weather is perfect outside, much less umpteenth below zero! Surviving winter in the North Pole is a challenge and the polar bears of Coca-Cola seem to actually enjoy it. From surfing waves made of ice to pushing a yule-tide tree to their cozy den, there are no sad, pouting homebodies in the icy plains of the Arctic. These bears simply know how to embrace the season! You can embrace the season too if you dress right. 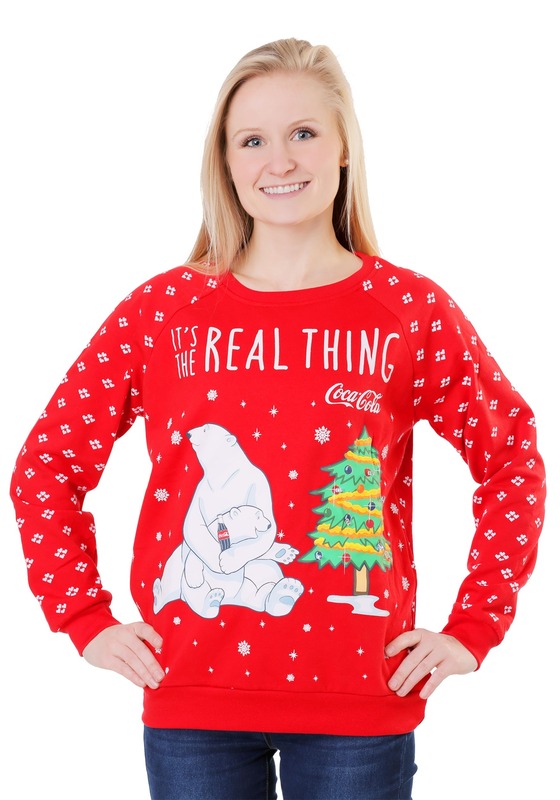 You'll learn how to embrace the season too when you're rocking this cheerful red Coca Cola Polar Bear Light Up Sweatshirt. Great for grabbing a Coke with a friend or heading out for a picturesque caroling session, you'll be able to spread the cheer with the blinking, color changing lights on the tree. With a sweatshirt like this one, no one would accuse you of faking your holiday spirit. They'll know that it's the real thing!